If housing and other things can be real expensive, so can energy. 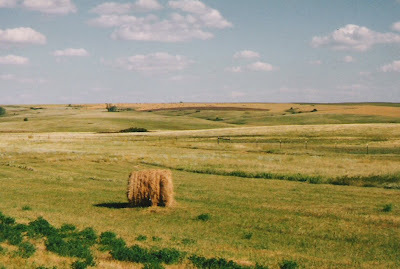 Biking through North Dakota in 1998, I passed quite a few oil wells in the hay fields. I also have a picture of an oil well, but that's from Wyoming. My 1991 trip. While offshore drilling and Alaska's Anwar are being debated, quite a few people don't even think about North Dakota. Where's that? Who's ever heard of Williston or Lake Sakakawea? I hear there's an oil boom going on in that area. Even this article, from 2 years ago, explains things. Supposedly, there could be lots of oil there. Some other articles have even suggested oil comparable to the reserves of Saudi Arabia. It's just more expensive to extract, but at over $100 per barrel it might be doable. New technology, such as sideways drilling into the Bakken Shale. It isn't strip mining. Just letting it drip out, I guess. Reassuring news, in some ways. At least we aren't likely to starve. There's still oil for agriculture and trucking. It just gets expensive. We can still eat. What's hit harder than eating is driving; especially long distance commuting. In the cost of food, "energy" is just one of several expense items. In driving, it's "the elephant in the room." With shorter commutes, even driving might still be affordable. I've never driven though. Bicycling really shines these days. Living in town helps. I hope living in town remains affordable. Pretty soon, a lot more people may want to move to town. I do bike long distances, but it takes time. My lifestyle in the slow lane. An "alternative lifestyle." In 1998, I biked through Williston, ND. and had lunch at Lake Sakakawea. Out in the grasslands. I was on my way from Bellingham, Washington to the Great Lakes. Took 2 months and I came back on Amtrak. The world was a bit different then. Oil prices were really low. Low compared to other things in our economy. China was still a big consumer, but less of a consumer than it is now. 1 billion 3 hundred million people makes a difference. In the late 1990s, Asian stock markets tumbled. Those economies slowed down and oil demand dropped. This freed up lots of oil for the West. Energy was cheap and much of America was booming. Not the North Dakota oil country, however. It felt kind of quiet, like a back water. Miles of hay fields. Not a lot of human excitement. Don't need to pay $400 for some Buddhist "quiet the soul" workshop. Just bike across miles of hay fields. Meanwhile other parts of USA were almost exploding. Real estate was going up out of sight. The dot com bubble was growing. Places like Santa Cruz, California were getting expensive. Rents and house values were skyrocketing. Pushing poor working souls farther out into the boonies. Longer commutes, but gas was cheap. Of course Americans didn't really address the energy issue back then. It was "back burner." Most of us somehow survived spiraling health care and housing costs. I'm not necessarily for or against drilling. I just keep biking. People have to do what they have to do. Now the news is full of our presidential candidates who have stances that evolve with time. Both McCain and Obama starting to see the need for some offshore drilling. North Dakota also, I guess. Obama talks about the need to transition into cleaner energy sources. Transition toward more renewable energy. Solar power. Wind. 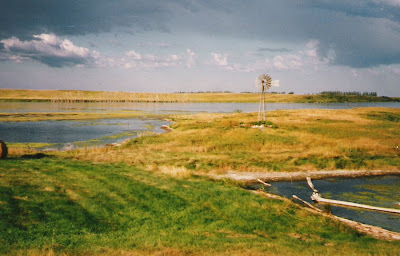 Here's even a picture of a wind mill somewhere in North Dakota, but wind power is a different kind of windmill. Campaign strategies must now be saying, "oil is still needed to transition us to better futures." For the long view, McCain is a big advocate of "non greenhouse gas emitting" nuclear power. I'm still for Obama, but "nuclear" might be needed as well. Also windmills, solar panels, my bicycling lifestyle and a lot of other things. Other parts of the economy have boomed and gotten pricey. Now it's energy's turn. You say, what about oil company profits? Well, maybe they'll invest them in a variety of energy sources. Sideways drilling. Even solar power. Can get expensive. If houses can be so expensive in places like Santa Cruz, CA., I guess energy costs something also.